All of our hosting plans are discounted to Mom Pack members through The Design Shoppe. We operate our own web servers and are not resellers or affiliates of someone else. Mom Pack is owned, operated and hosted by The Design Shoppe (our mother site) so you can verify our 99.9% web site uptime. We are also an ICANN accredited registrar and approved to register domain names. 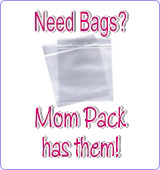 Domain names are $12.00 per year for Mom Pack members. When considering any web host, read this helpful article first. Coupon Code: MOMPACK250 Need a different plan? We can create anything. Well, almost! NOTE: The above rates are Mom Pack member discount rates. Please be sure to specify that you are a Mom Pack member by entering the above coupon codes when placing your order or you will be charged non-member rates automatically. You may cancel at anytime - see our site for details. Thank you! TheDesignShoppe.com has been helping small business owners get their websites up and running since the year 1998 through this domain name. We host our clients' websites on our own dual Intel Xeon 2.4 GHz servers. Our servers are fully managed and maintained to the highest security levels available today and housed at a datacenter that cannot be beat. We accept: Visa, Mastercard, Discover, and Paypal.